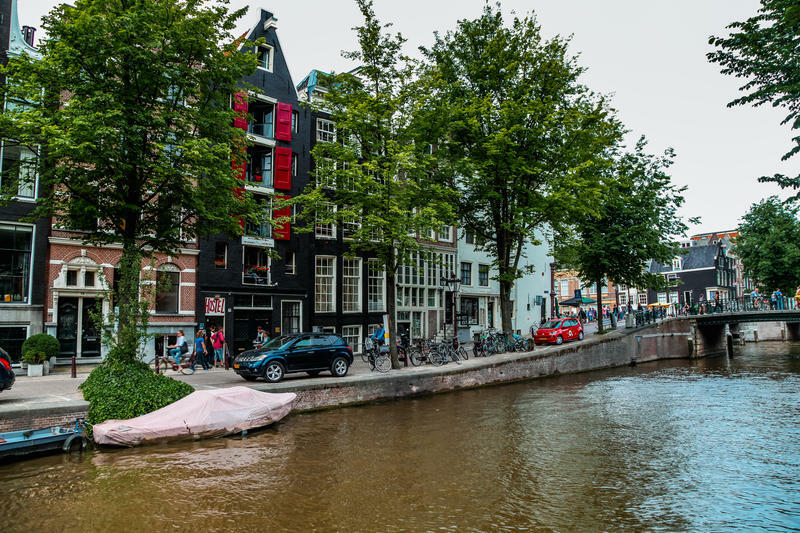 Our hostel is set in a 17th-century former warehouse located in the heart of Amsterdam on one of the most beautiful canals in the city. It's just a few minutes' walk from the Leidseplein to here and very close to the museums. 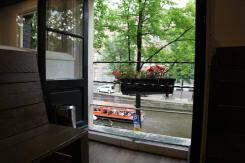 Our hostel overlooks the canal and is ideal for backpackers, students and young people. 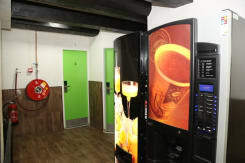 We have four single beds in the four-person mixed rooms with shared facilities, with backpack-sized lockers for each bed. Showers and toilets can be found on each floor. Breakfast is served in our canteen from 9am till noon. An Internet station is available at the reception area. We also have Wi-Fi. The lounge has vending machines, TV and a pay phone. We also offer bicycles for rent. Please note that we do not accept guests under 5 years of age. Smoking Lounge inside our hostel. If you don't smoke we have a non smoking place also. *free wifi also in the rooms. Reception is open 24 hrs there is no curfew. Please consider the neighbours and other guests sleeping in the hostel when you return late at night ! City tax of 6% is not included and will be added to your balance upon arrival. There is a 5% surcharge when paying with Visa or Mastercard and 10% surcharge for American Express. We have a 72hr cancellation period during the week. Cancellations made less than 72hrs in advance shall be charge for the first night accommodation. We have a 96hr cancellation period for weekend reservations (Fri, Sat, Sun). Cancellations made less than 96hrs in advance shall be charge for the first night accommodation. Cancellations made at arrival shall be charge for the first night accommodation plus 50% of the remaining nights. Cancellation during your stay and your reservation is prepaid you will be charge for the rest of your booking (100%). For all holidays, ALL CANCELLATIONS, regardless of arrival date, are required to be emailed to the International Budget Hostel 3 x weeks prior to arrival date (not arrival time) failure to do so will incur a 100% charge. We will pre authorize your credit card before arrival according to the cancellation policy. Authorization means that we ask the credit card company to block an amount on your credit card as a guarantee for the hostel (normally equal to the cancellation fee). This amount is valid for 4 weeks, thereafter it is automatically released back into your account (depending on the credit card company and the country). We have no control over the release process The reservation will be terminated if the hostel does not get authorization on the credit card. A prepayment of 10% of the total amount of the reservation is required for guests staying 7 nights or longer. This prepayment is non-refundable. We're near Anne Frank House, the Van Gogh Museum, Rijksmuseum, Vondel Park, the Torture Museum, the Red Light District, Dam Square, Rembrandt square, Leidse square, the Flower Market, Waterlooplein, Rembrandhouse, the history museum, the Heineken Experience, Madame Tussauds, and a wide range of the best coffee shops.